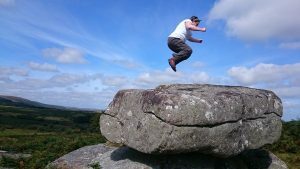 Part of my extreme aversion to stepping stones is my complete and utter inability to do any form of jumping. Although, these days, I have relatively non-jumpable knees, I was never very good at it and can remember running out, crying, onto the secondary school playing field instead of facing my nemesis, the high jump. 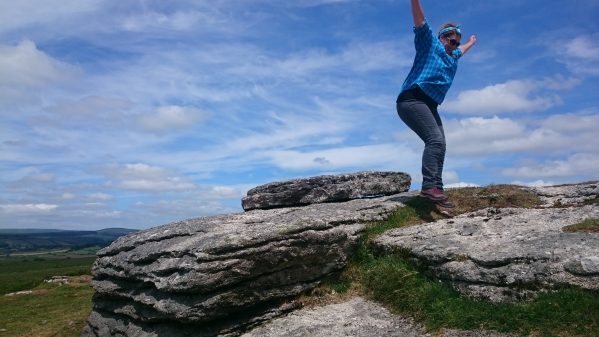 A while ago I took some great photos of Not-At-All-Blonde jumping on a Dartmoor rock near to Bowerman’s Nose and, as I was out with her for a 25th birthday walk last week (how weird that we should be the same age), I decided it was about time I got a similar photo of myself jumping. The first rock I stood on was too high (we are talking under a foot here) and there was much havering. 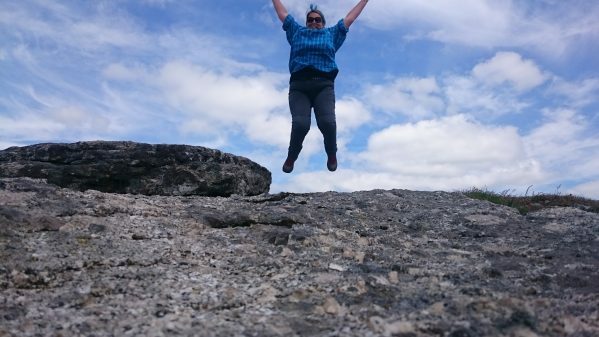 Then I tried to ignore rock shelves for a while and do my jumping straight from the floor. The photo below amply demonstrates my inability to get off said floor. 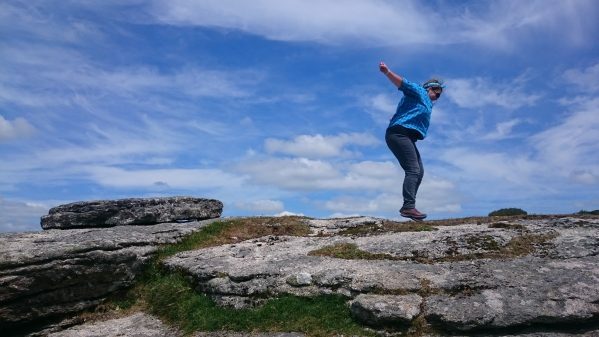 Things did eventually improve with a bit of jumping practice but it would appear that the heady heights of ‘big air’ are going to continue to evade me. Plus… my right knee still hurts! I applaud you for trying, but I reckon that old cliché: “you can do anything if you want” is a bit misleading – there are sometimes things you just can’t do and Wainwright, the ultimate grumpy old man, realised this. In the middle of nowhere, on the Wet Sleddale Horseshoe there is a large boulder called Gray Bull. Years ago when I was in my second childhood, age about 60, I ran round that horseshoe and climbed onto Gray Bull with ease, but more recently, on my campaign to bag all Wainwright’s Outlying Fells with my friend BC, we came across Gray Bull again and there was no way I could get onto it. See Dropbox link below. I am all for getting kids to exercise within reason, but forcing people who are obviously not suited to certain pursuits, perhaps high jumping for example, is just a means of humiliating them, much better to find something where they show some aptitude and develop that. Thanks Conrad. It is a shame that the occasion of the un-jumped high jump is my over riding memory of school sports. Having said that, things are mostly different now and I know some most excellent and really dedicated PE teachers.